I participated in an online conversation about Cystic Fibrosis last night. Check it out. A friend made this for us and it is being shared by hundreds of people on Facebook. If you'd like an easy way to ask others to pray for Tricia, feel free to download and then share as well...and feel free to point people to the blog. After over a week in the hospital, Tricia was discharged on Wednesday. She began her physical therapy at Duke yesterday. She will go every weekday for about four hours to help strengthen her body in preparation to be placed on the transplant list. I did not realize how sick Tricia has become until she got "home" on Wednesday. Her breathing is incredibly laborious. I was up most of that night in bed listening to her breathe...the bed literally shakes with each breath because she puts so much effort into it. It reminds me of this exact same time five years ago when she was pregnant with Gwyneth and I would wake up several times a night just to make sure she was still breathing. I am very concerned for her. This has all come on so quickly, and I know it has her really worried that she won't be able to be strong enough to get on the transplant list. We are in Durham now, Tricia is full time and I'll be traveling back home on the weekends whenever possible. This was much easier the first time when we did not have children. We are thankful for our family and friends who are helping us. 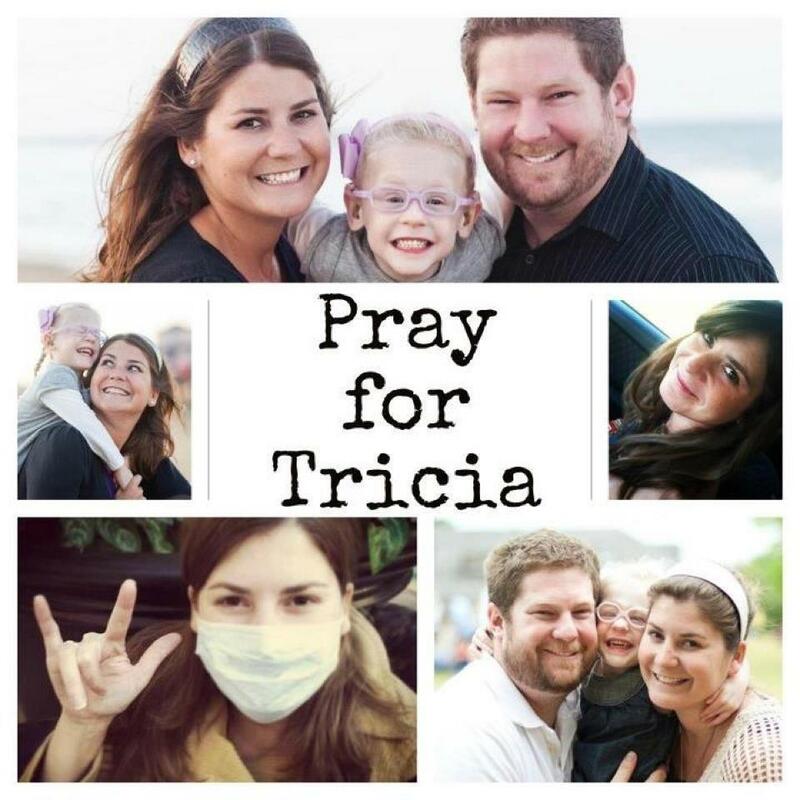 Please continue praying for Tricia, that she will be strong and healthy enough to be listed as soon as possible. Please pray for our children, Gwyneth and our foster child. Tricia is still feeling the same. Infection is still there, she is on O2 as needed. She had a very simple procedure today to fix her portacath because it wasn't able to draw blood. She is having another simple procedure tomorrow to change her feeding tube from a G tube to a G-J tube. If all goes well over the weekend, she will be discharge early next week and will immediately begin physical therapy at Duke to prepare for a transplant. From what we've been told, she is now in the window, but needs to build her strength up to prepare for surgery. I'll refer you to This Post from 2008 for a description of how the whole transplant process works at Duke. You might remember from her first transplant that she was a very hard match because of the antibodies in her blood. We've been told this time that, because her antibodies have changed, she should be a much easier match. But, she probably won't be at the top of the list like she was before, so there is no telling when the call might come once she's on the list. We have appts on Wednesday, but we are going a day early because Tricia is not doing well. The past two weeks, she ha gone downhill fast. We need your prayers. If she is not yet at the point of being listed she is quickly approaching it, and if she does not get rid of this infection soon, the window might close before she is ready. Thank you. I brought Tricia home on Friday, but she is not doing any better. Her medical team did what they could for her, put her on some different meds. The more time she spends in the hospital the more likely she is to pick something else up that is detrimental to her health. She is not currently on O2, but we think she will be soon. We go back to Duke this week, and wouldn't be surprised if they either keep her in the hospital or tell us that she is ready for transplant. Tricia is having more difficulty breathing this week. She is heading to Duke tomorrow to be admitted. Please pray that her medical team will be able to get this infection out of her lungs ASAP.